A big part of Janis Foligno’s life was the happiness she found through helping others. It’s something her sons, who both realized their NHL dream, have never forgotten. A big part of Janis Foligno’s life was the happiness she found through helping others. It’s something her sons Marcus and Nick, who both realized their NHL dream, have never forgotten. What he saw time and again was never about seeking recognition. It was, recalled Nick Foligno, captain of the Columbus Blue Jackets, countless humble acts that came from the heart. 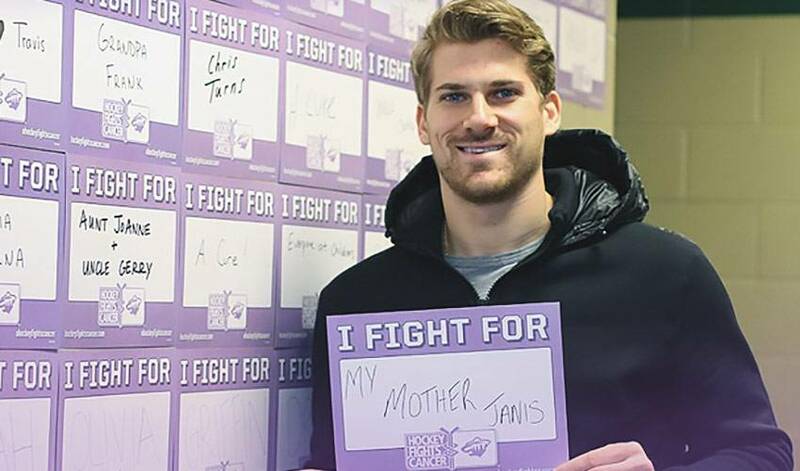 Janis Foligno was tireless in her desire to make a difference right up to her passing on July 27, 2009 after a battle with breast cancer. If someone was in need, she was always there. She volunteered her time with Meals on Wheels, delivering food to shut-ins and recovering patients, often spending time with people after her rounds to lend an ear, give them a hug or just to let them know someone cared. She participated in the Walk for A Cure in Toronto and The Relay for Life in Sudbury, Ontario, helped raise money and awareness for women to get screened and championed the fight against Breast Cancer. Janis was also on the Sudbury committee for the Canadian Cancer Society’s annual Luncheon of Hope. She assisted as a contact person for women that had been diagnosed with cancer. Come Christmastime, she always found something to bring to the Salvation Army or Goodwill. When Janis died eight years ago, her family wanted to honour her memory in an appropriate and heartfelt way. Less than one year later, the Janis Foligno Foundation was established. The foundation has supported numerous charities and initiatives since it was launched, including the Sudbury Regional Hospital Foundation's Breast Cancer Equipment Fund, the Vale Hospice, Meals on Wheels, the Children's Hospital of Eastern Ontario (CHEO), the Ican Independence Centre & Network in Sudbury and the House of Kin. Not a day goes by without the siblings thinking of their mother. Before or after games, on a day off, during family gatherings, events through the foundation – Janis is constantly in their thoughts. For more on the Janis Foligno Foundation, visit www.janisfolignofoundation.com. When it comes to naming his top five singers, the Columbus captain’s list contains a little bit of everything, including country, rock and an iconic Canadian vocalist. There was a time when Nick and Marcus Foligno would tee off, literally, on one another. On a Wednesday afternoon at Glen Abbey Golf Course, the brothers brought their now friendly sibling rivalry to the annual NHLPA Golf Tournament. What would Buffalo Sabres forward Marcus Foligno and his wife, Natascia, serve up if they were to host an Oscar Party to celebrate the upcoming Academy Awards? Here’s one thing you need to know: you wouldn’t go home hungry.